Iron Cross is well known for playing by their own rules and bucking industry trends. Well, they certainly didn't follow anyone's example when they built the HD wheel to wheel steps. This piece of steel is mean looking, twice as tough, and a great way to hop into that jacked-up truck you're driving. Built off of a polygonal main tube, the Iron Cross HD wheel to wheel step bar offers a distinct look that is not imitated anywhere else. Constructed of steel, once you get this beast on your truck it isn't going anywhere. Finished with a textured gloss black powder-coat, this bar is going to stand up to everything the road has to offer. A third step means reaching in the front of your truck bed has never been easier. Iron Cross also equipped there steps with a non-slip surface, which makes getting in and out of your vehicle less of an adventure and more of an afterthought. Iron Cross backs up there HD wheel to wheel step bars with a 5 year warranty, meaning that you can have confidence that these bars are meant to last. The bars include mounting hardware and brackets that are vehicle specific for an easy, bolt-on installation. So, if you're looking for something more intimidating than anything else on the market, you found it. 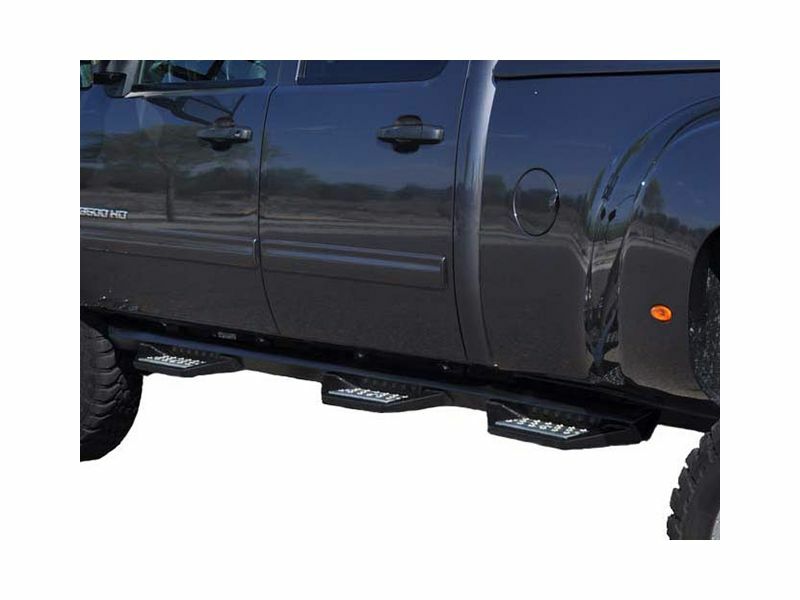 Iron Cross HD wheel to wheel steps are unlike anything on the market; you're truck will never be the same again. Get yourself a pair today, you won't regret it. Iron Cross is offering a five year warranty on the HD wheel to wheel steps. The warranty covers against manufacturing defects and workmanship. If you have any other questions, feel free to contact our elite customer service department at 1-877-216-5446. Iron Cross HD wheel to wheel steps are tailor-made to fit your vehicle. The steps easily install with drilling required on some models. If you have any questions, give us a call 7 days a week at 1-877-216-5446.